Pomade is a barber’s hair-styling ointment with a long history, peaking in popularity decades ago but now becoming more common again due to innovative changes in the basic product. Among the changes to the product are the ointment is now water soluble, the product is offered with different scents and it is easier to wash out of your hair. The basic substance is a thick, sometimes scented gel-like substance and often described as a “greasy” substance that is applied to hair in order to hold it in place after styling it. Applications of pomade may be thick or thin allowing hair styling preferences to be more or less conventional. In all cases, this product allows styling to hold firm and provides a shiny appearance for extended periods of time. 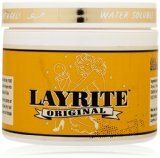 This product is made by Layrite and comes in a compact and sturdy four-ounce container. It is designed to serve as a contemporary choice that provides the look and feel of traditional wax applications from the “good ole greaser” days while still offering notable improvements. Layrite Deluxe is designed to yield a naturally soft look without any flaking. 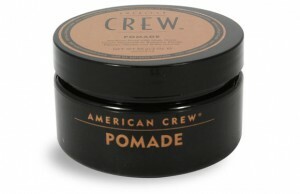 It is water-based, so it can be more easily washed out of one’s hair compared to oil-based and other types of pomades. The control and versatility factors are highly rated as it can be applied to dry hair, as well as wet, and responds quickly to applications. By adding more product or simply more water, you can achieve any desired look and feel that you want. It retains its flexibility even after being applied, so restyling later is easily accomplished. None of the traditional strength or shine is lacking, however, as many online reviewers have positively noted, the manufacturer accurately emphasizes its capacity to manage even thick, curly hair. Online reviews also note with approval that this product does not have any irritating or strong scent, washing out without any noticeably greasy residue. Pomade is one of those personal products that fulfill a practical function while also making a fashion statement. This means that all of the conventional considerations apply when a consumer prepares to make a pomade purchase. At the same time, choosing a particular brand can connect a consumer to a cultural group or historical tradition of some type. Thus, consumers have a much broader and still more interesting range of options, even if the final choice of their preferred product may also be more challenging to work with. The long history of pomade use and pomade products is interesting in its own right. It can be relevant when it comes time to purchase the product because of the connections that exist between some cultural, sub-cultural, and historical traditions and the various pomades available on the market. For example, the recent arrival of water-based pomades has led to a reawakening of pomade use. At the same time, traditionalists may proudly keep buying and using the oil-based pomades that were for decades the primary pomade products in use. Some of these oil-based pomades achieved fame through their appearance in movies or books or within such distinctive social groups as the “greasers” back in the 50s and 60s era. So, purchasing pomade may not simply help a consumer keep that oldies “pompadour” in place and shimmering brightly, it can make a fashion statement that says as much as the style of one’s hair. Other cultural considerations apply as well. Different sub-cultural groups today take special pride in certain brands of pomade. As just one example, many of the pomade users in lowrider-Latino-rockabilly circles can be found sporting the Suavecito product that takes its name from a particular song, which is significant for this distinctive social and cultural group. The product choice is yet another way to show off what you value and what group you belong to. Personal preference and style, as well as cultural commitments and social character, can play a key role in the purchase of pomade. It is very clear pomade can do much more than lift one’s hair up or push it to the side and hold it in place. Setting aside tradition and culture and all the rest, pomade exists for a practical function. And, just like any other product on the market, it can be selected because of the usual “basics” involved in any purchase. Cost, container size, and the number of uses are several of the most basic considerations. Pomade users should bear in mind how often they will want or need to “slick it down” or up in any given week. The durability of the product is a relevant factor as well. For example, the typical oil-based pomade is going to last much longer than the typical water-based pomade. One trade off of this is that oil-based pomade can leave an oily smudge or possible stain, perhaps on a car seat headrest or a pillowcase or other similar objects that come into contact with your hair. Also, water-based pomade is much easier to wash out of your hair compared to the typical oil-based pomade. Health considerations should not be overlooked when using pomade. 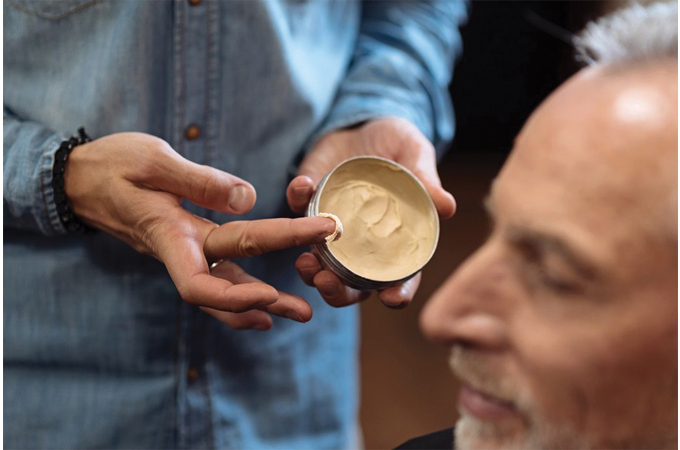 While individual consumers will have different experiences, it is generally agreed that oil-based pomades have a greater negative effect on hair and scalp health. So, buyers should balance the positives of different types of pomade against possible health challenges involved. There is some middle ground to consider as well. Pomades that combine oil and water are also available for purchase. At the same time, there are “natural” pomades available, such as a beeswax product. These appeal to many consumers who prefer to avoid actual or possible chemical extras that come in other available pomades or simply favor pomade made from more natural sources. Buyers are well-served to remember that pomades come in a wide variety of forms. They may be colored to a significant degree or lack any coloring at all. Again, personal preference and style in combination with practical functionality will lead to the best choice of pomade for each consumer, with the added bonus of having many different choices that invite experimentation until the most fitting match is discovered.